Enjoy our traditional recipe featuring the favorite herbs and spices found in Italian cooking. The flavor and aroma make this USDA Beef Sirloin Tri-Tip perfect as the star of any meal, anywhere. Beef Sirloin Tri-Tip, Water, with less than 2% of the following: Basil, Rosemary, Oregano, Marjoram, Garlic, Onion, Olive Oil, Spices, Natural Flavorings, Lemon Juice Solids, Soy Sauce (Water, Soybeans, Salt, Sugar), Salt, Dextrose, Sugar, Maltodextrin, Modified Corn Starch, Potassium and Sodium Lactate, Sodium Phosphate. I forgot the rating! 5 stars!! 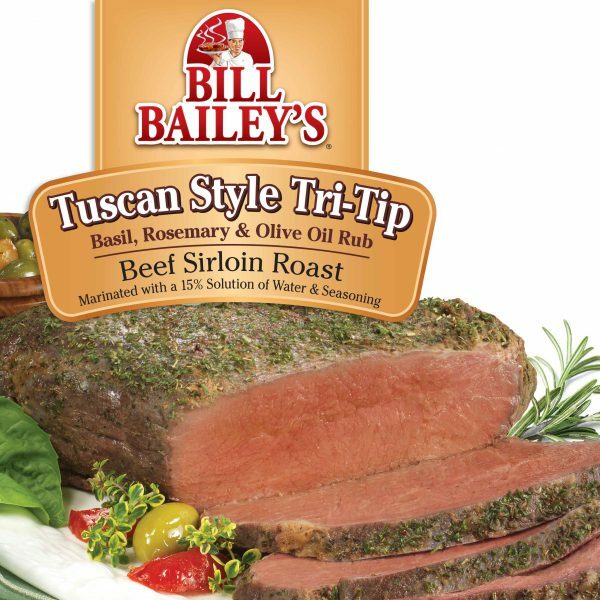 My husband and I tried “Insta Cart” a few weeks ago, and instead of getting us the tri-tip that was on sale, the young man got us the Bill Baileys Tuscan Style Tri Tip beef sirloin roast. Our store was out of the other…Well, we decided to keep them and thank heavens! OMG! Absolutely the best tasting tri tip ever! Might of cost more, but way worth the difference! It just melts in your mouth! Wonderful flavor! Unbelievably delicious! Thank you Bill Baileys! This is what I will serve my guests! And us, from now on! I used the oven method and was skeptical…ha, not any more! So juicy and delicious! Thank you again!! Hi Kathy! Thank you for your review. Sometimes what starts as a mistake works out even better than we thought, and we’re so pleased that Bill Bailey’s is now part of your grocery list. Cheers!